It has been quiet some time since I haven't posted. A couple of people have dropped a note if i have quit?? Probably not. Its just that I was occupied with other work and couldn't write. Having said that, let me move into the microbiology. Since the Chinese influenza strain (H7N9) has captured the international attention (Link here and here) of health care associated personals, a lot of articles have been published regarding the influenza. The most important focus among most of them is to think about a possible vaccine. Often people have brought into question if vaccine can be an answer for influenza. The problem of answering the question is both "Yes and No". The Yes side of the situation is that vaccine is fantastic when the option is available. And the No side is that a complete universal vaccine is not available. Let me elaborate. Fig 1: Time taken and activity in preparation of influence vaccine strain. Influenza is a player when it comes to antigenic display (Antigenic shift and drift). H stands for Hemagglutinin and N for Neuraminidase. For a detailed discussion on the relevant structure and basics of virus refer to my previous post (Link). The most important point is varieties of H can pair with variants of N to form a new recombinant virus. The dynamics of influenza has been well studied and its safe to state that "multiple types of recombinants emerge in any given period of time, of which some become pathogenically viable enough and establish itself". Most of the time, the virus has been in zoonotic circulation. The health authorities especially WHO (through periodic surveillance, GAR) estimate the prevalent novel strain and use that recombinant as a guide to produce a vaccine. The vaccine strains are usually grown in eggs. The problem associated is that many strains don't grow well in a chicken egg. To circumvent the problem, the genes of interest are swapped into a strain (Lab adapted) that is more fit to be grown. The process takes about 2-3 weeks. This Hybrid virus is used to now grow the required strains. The hybrid virus is after a quality control and verification procedure is referred as "Vaccine Strain". This vaccine strain is distributed to vaccine manufacturers. The process has to be repeated every year. The obvious idea that strikes the most readers is, why don't the scientists make a universal vaccine? Unfortunately that is too much to ask for. There are almost 17 different types of Hemagglutinin and 9 different Neuraminidase. That leads to a combination possibilities of 17 x 9= 153. For each type there are subtypes and for each subtype virus, the hemagglutinin gene variants (owing to mutation) exist. That is virtually more than 1000 different combinations. So a universal vaccine is not a good idea. I need to interject a little bit here. Often there is a non science group of people who would get up and ask is the vaccine is really worth?. The simplest example that i can cite is the 1918 pandemic sweep. That pandemic nearly cleaned up the human population (vaccination was not available). If you are still not convinced a recent study showed that vaccine has saved millions of life. Kostova etal has shown that by regular vaccination in U.S has likely prevented 13 Million illnesses, 110,000 hospitalizations from a time period of 2005-2011. Senior author on the study Joseph Bresee adds, "These results confirm the value of influenza vaccination, but highlight the need for more people to get vaccinated and the imperative for vaccines with greater efficacy, especially in the elderly." Source. Based on the above arguments it is clear that improvisation is very much in need. So what have we got? If you had read my previous blog, I explained that if we have too many antigenic combinations to deal with, a broadly neutralizing antibody (bnAb) would be a better approach. 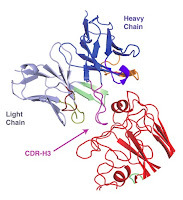 Harrison etal, demonstrated a class of antibodies referred as CH65. CH65 heavy-chain CDR3 region interacts with the the receptor binding pocket on HA1, mimicking interaction of the physiological receptor, sialic acid. The antibody was isolated by a vaccinating a volunteer with 2007 trivalent inactivated vaccine and subsequent isolation after one week from a single plasma cell clone. A recent publication in Nature by Nabel etal, demonstrated the use of self assembling nano particles (viral haemagglutinin genetically fused to ferritin), which was able to elicit bnAb. That's something which the scientists can bank upon. Vectored immunoprophylaxis (VIP) is definitely my latest favorite. The same group that experimented on HIV- VIP, has also demonstrated its use for influenza vaccination also (Reference). Multiple different manufacturers are interested in a quadrivalent vaccine. Fluarix Quadrivalent and FluMist Quadrivalent are the 2 FDA approved quadrivalent vaccine. The trivalent version is however marketed by multiple suppliers (Link). The trivalent influenza vaccine (TIV) is available in two forms- with ASO3 (Pandemerix) or without ASO3. ASO3 is a patented adjuvant system used by GSK. Chemically it is α-tocopherol and squalene in an oil-in-water (o/w) emulsion. Studies have shown that ASO3 is much better than other adjuvants such as aluminium hydroxide. AS03 system promotes monocytes action as the principal antigen-presenting cells, and has significant effects on granulocytes and cytokines which enhances the antigen-specific adaptive immune response. In a phase 3 randomized trial (funded by GSK) with 43802 participants, showed that there is a considerable advantage for ASO3 TIV in comparison to TIV alone. But there has been some concern recently that ASO3 probably increases the risk of narcolepsy. Multiple studies has been done on this issue and reports claim both sides and there is no convincing report. A very recent publication in BMJ (retrospective analysis), showed a very bleak association. Squalene is the most important component of the ASO3 adjuvant. A study published by Kuroda etal, had hinted that a single intraperitoneal injection of the adjuvant oils pristane, Incomplete Freund's adjuvant or squalene induces lupus-related autoantibodies to nRNP/Sm and -Su in non-autoimmune BALB/c mice. There are also publications that this is not most possibly the case. Narcolepsy is a neurological disorder that affects the control of sleep and wakefulness. To the best of my knowledge, the exact mechanism pathogenesis is not known. It is most possibly a disorder that effects monoaminergic or cholinergic systems or both. The estimated vaccine-attributable risk of developing narcolepsy owing to ASO3 is about 1 in 16000 (Reference). From the said features, I conclude that narcolepsy mostly is a genetic predisposition that could be escalated by ASO3. The likeliness that ASO3 itself induces narcolepsy is unlikely. But i would like to see some further studies and more to clarify. Currently am aware of a study sponsored by the CDC which is expected to resolve the issue, expected to be completed by 2014-15. Owing to the benefit of doubt, the FDA has currently declined to approve the GSK ASO3 based vaccine.